One of the dilemmas of being a young person in today’s society is that you want to have your say but you’re not being heard. This is an even bigger hurdle for people under 18 who can’t vote yet. Even if you can vote, you get to vote only once every few years and that one vote is supposed to reflect everything you believe in. But there is another way in which everybody can be heard and where a single vote can hold more proportional weight than at election time. In the Summer of 2011, the government introduced a new website which makes creating and signing e-petitions considerably easier. 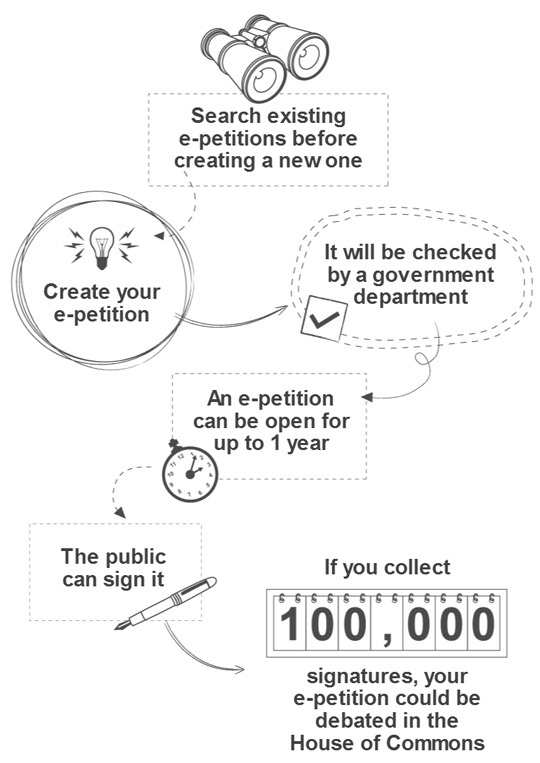 An e-petition can be created by and signed by anybody in The UK. And they can be about any topic you like. When an e-petition is created it can stay open for 1 year. Once an e-petition reaches 100,000 online signatures and is championed by an MP it will be put forward to a panel called the Backbench Business Committee. The Backbench Business Committee will then decide whether to allocate a debate on the subject. When a subject is debated it can be watched on Parliament TV, where you can also catch up with previous debates. Getting a debate heard just by achieving 100,000 signatures on a petition is not guaranteed. However there is the distinct probability that it will be discussed. As such, it is a very effective way of having your say on individual topics at any time – not just every few years at election time (if you are old enough!). To view all of the open e-petitions or search for more e-petition topics, click here. Who can sign or create an e-petition?